Our daughter always watches her big brother, including all all of the bad things… She observed our son going through the stair railing and decided to try it. She now steps through the bars and waits with a big grin for a reaction by my wife or myself. While it is a bit funny to see the big grin on her face, we don’t want her falling and getting hurt. The solution I brainstormed was a clear plastic barrier that would span the gaps in the railing. Because the barrier would be clear it would have the added benefit of keeping the existing decor. The cost of plexiglass was prohibitive, so I decided to go with clear acrylic. I made marks at the top and bottom of each piece of railing, drilled holes and used zip ties to secure the acrylic to the railing. Since this is at child height I also rounded off the corners with a coping saw to prevent any injuries. 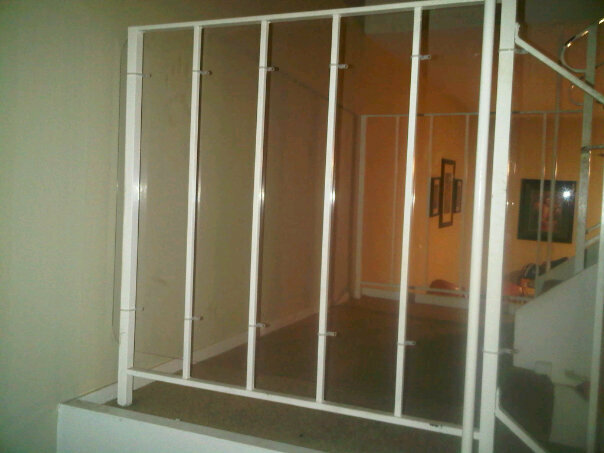 Adding the acrylic sheet to the railing. Clear Acrylic Stair Guard installed. Hardly noticable to the casual observer. With a growing family we are constantly running out of storage space. One problem area has always been the coat closet. It had a single shelf with a bar to hang coats. I don’t think there has ever been a coat in this closet, but there has been a lot of food storage, camping equipment and miscellaneous children’s items. So along with a friend I set out to reduce our storage woes and fight entropy. 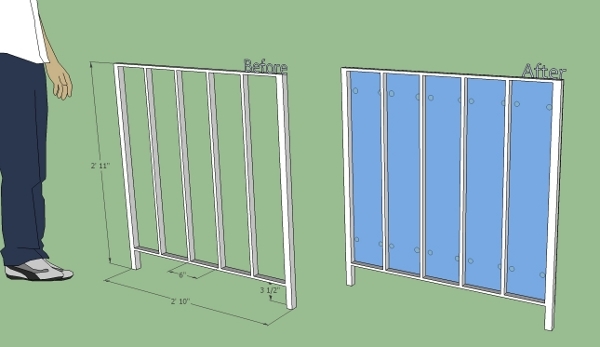 The design I cam up with is the five shelf solution shown below. 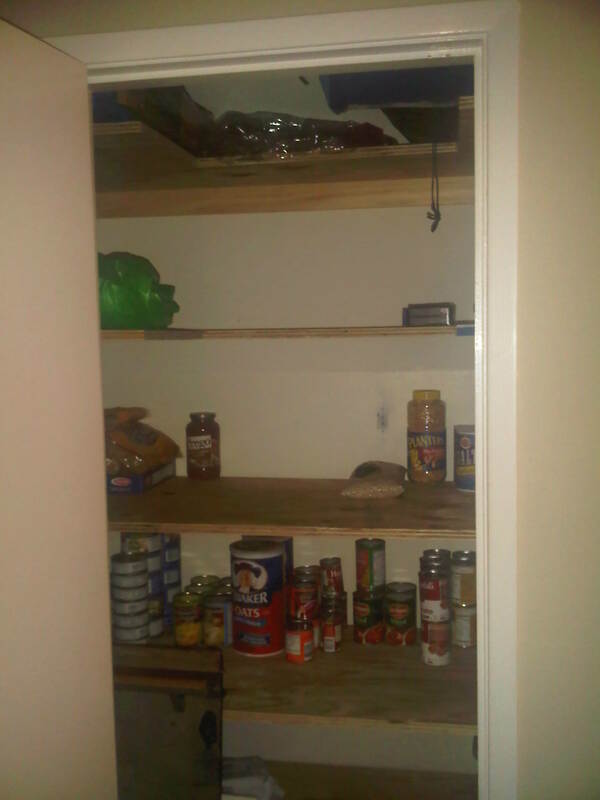 The top two shelves feature a cut out to facilitate access to the topmost shelf. (which is nearly above the door frame) At a later time I will add finishing details to make these shelves have a little more curb appeal (simple molding, white paint) For now we have a simple and study shelving system. 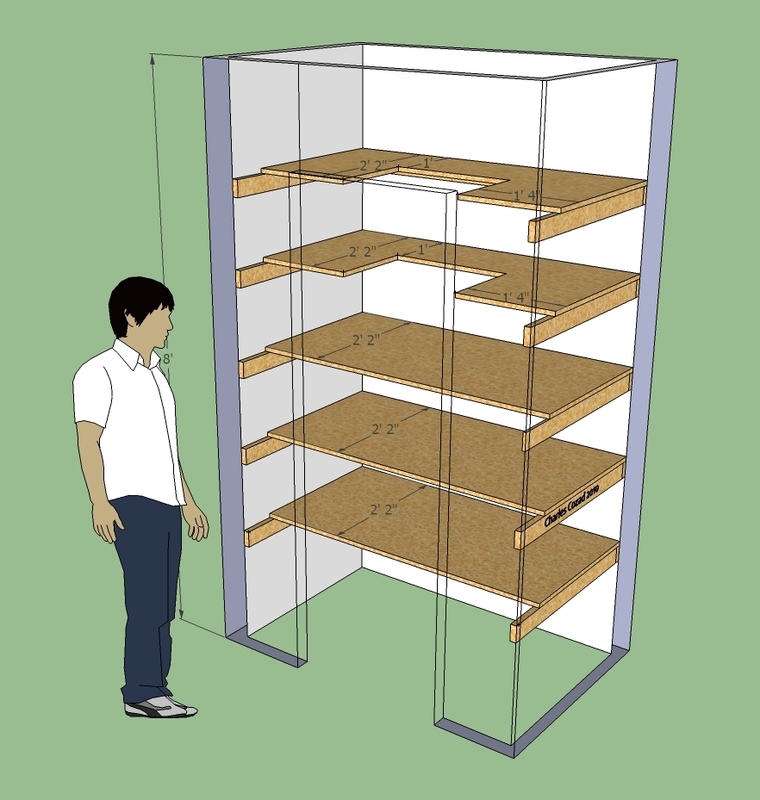 The plan for the five shelves.